I came back home from work starving, as I didn’t eat anything sine I woke up, I planed to spent the day watching movies, didn’t know what to eat !! I promised my self to start dieting these days, and I am not in the mood of having salad or soup! I wanted to have something special while am watching the movie, and so entered 6alabat website as usual where they provide a variety of restaurants and my eyes goes directly to Peppes Pizza, Emmm lets see what can I order from Peppes!?? 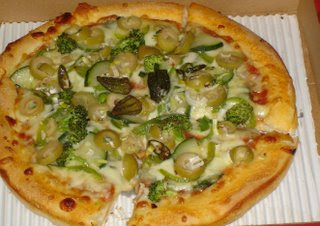 I have chosen the GREEN HEAVEN Pizza convincing my self that it is the perfect choice for a person like me who just started dieting, I was reading the ingredient and it was a mix of several vegetables like (Marinated Spinach, Broccoli, Zucchini, Leeks, Green Olive, Green Pepper, Chilly and Okra.) then I said: this is the right option, frankly it was very delicious and tasty, I had the ELECTRIC BLUE for drinks it is a Combination of blue Curacao and sweet & sour mix. It was a perfect choice I really enjoyed the movie and the food.